Go for complete Outlook PST file conversion that convert Outlook data file item including all folders like Emails, Contacts, Tasks, Notes and journals etc. easily with user friendly GUI. 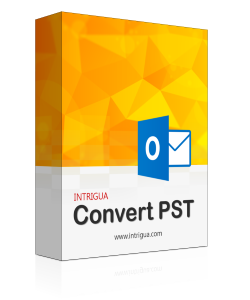 With the help of this software you can convert Outlook PST file into more than seven other file formats according to your needs. As these formats are required on regular working environment. If user wants to save only selective data items of PST irrespective of entire PST file, then this PST converter tool offers selective export of PST file by selecting the file items from category list. Software has the capability to filter the Email according to the category and File name conventions that will help you to extract the emails from PST file to other format. Transfer PST files/file into other formats will maintain the Email attachments and Metadata like to, Cc, Bcc, Subject etc as original in PST format. Software also ensures that the Folder structure and hierarchy will also remain intact after conversion. PST converter tool will automatically begin search for PST files in any directory, folder and sub-folders that will reduce the overhead of locating PST files in system. Software also support bulk conversion of PST file concurrently. A PST file, Personal storage table (.pst) file is an Outlook data file that has been created when you configure MS Outlook with POP3, IMAP or any other web-based email account. PST file contains email messages, contacts, tasks, calendars, journals and lots of other information. PST file stored in your computer and thus not bothered about the mailbox size limit on the mail server. One of the widely known application of PST File is that it can be used for archiving items from different email account type. As stated above that PST files are saved on your system but in a hidden directory structure, you cannot locate it by navigating through the directory. One method that is applicable for all MS Outlook and Windows versions to locate PST file is to Open MS Outlook >>Right Click on respective email account from the left pane >> Click Open File Location. When we want to share PST file from one organization to other, or sharing it between a group of users and the recipient needs a format other than PST format. 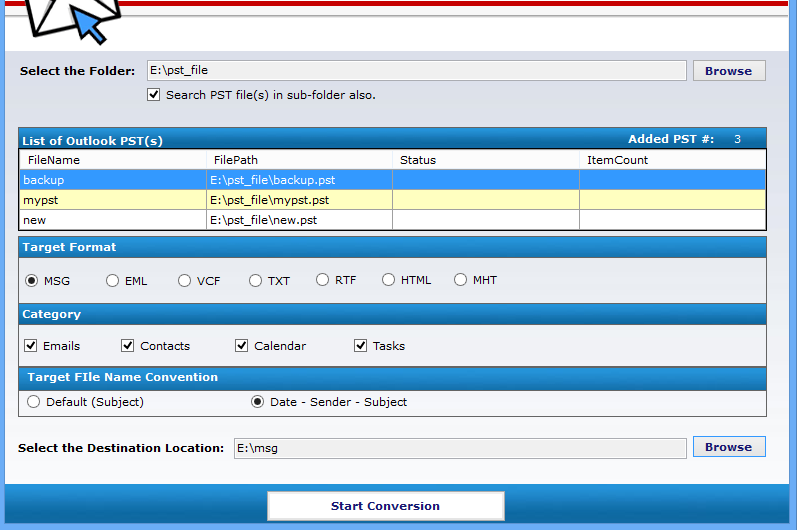 Often we require PST conversion into other email formats that support different platform of email clients. As most of the Email client like Microsoft Outlook express, lotus notes, window mail support different email file format. VCF format is a standard acceptable format for the contacts information. 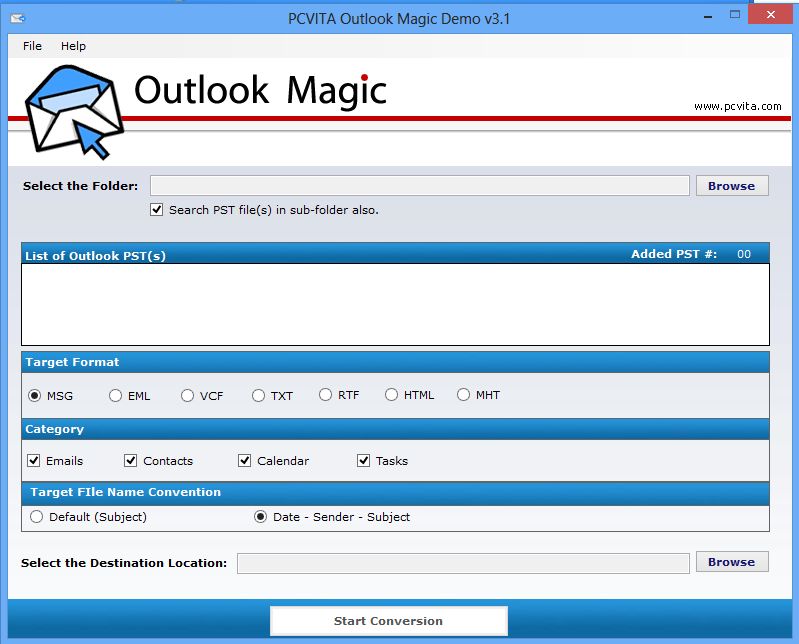 We can convert Outlook contacts to vCard for sharing it with others. Having the backup of files always seems to be good tactics in any organization, so to have a proper backup of emails and other data items of PST file we require conversion. Step 3: Select the Target file format for conversion and choose options to apply filter. Step 4: Select the location to save converted file and start conversion. Watch fully animated and dynamic video of Outlook P converter tool that will guide our users about its working. Get an easy and clear approach of converting PST files to other formats. Which version of MS Outlook PST file does the software support? Convert PST software supports PST file of MS Outlook versions 2013, 2010, 2007, 2003, 2002 and 2000. Is this software convert PST file into word file? Yes. By converting PST file into RTF file you can able to open it in MS word. Does this software run on Windows 10 technical preview? Yes this software can run on windows 10 technical preview. Also This software does not have any compatibility issue for windows version. How much time does it takes for conversion if we convert bulk PST file? Software does not take much time to convert large number of PST file. As it is a very fast process but depends upon your system configurations and data file size. Microsoft windows are supported by Convert PST software including Windows 8.1,8, 7, Vista, XP, 2008, 2005, ME, & NT (Any Version of Microsoft Windows). 20 MB of free hard disk space should be available to run Convert PST software. Really an incredible product for me as I wanted to convert all data of PST file to Outlook express supported file. And I also thankful to the support team which guided me in each step to complete conversion easily. Great tool with the capability to convert PST file into more than seven widely used file formats. It worked for me for various purposes so I give this product 10 on 10 for its unbelievable features and functions.